Much of world’s documentary heritage rests in vulnerable, little-known and often inaccessible archives. Many of these archives preserve information that may cast new light on historical phenomena and lead to their reinterpretation. But such rich collections are often at risk of being lost before the history they capture is recorded. 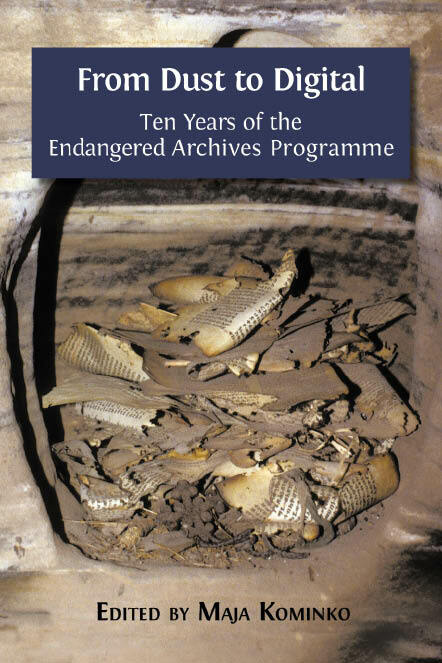 This week’s e-book celebrates the tenth anniversary of the Endangered Archives Programme at the British Library, established to document and publish online formerly inaccessible and neglected archives from across the globe. Being British, the collection of essays here are surprisingly diverse and not nearly as Pommie stiff or self-congratulatory as one might suspect. The book deals with archiving on the technical level but also on the theoretical one, asking legitimate questions about the values and uses of archives and archival work across the world. The official PDF and epub editions of this book contain embedded audio files. This version is not that fancy–or that large. Embedding audio in the EPUB would decuple the present size of the book, which, in our humble opinion, is already pushing it for one of our versions. Still, it’s eminently readable. The rather academic tone of the book with endless professorial MLA-style footnotes and references etc is largely mitigated by the pure power of the material being archived. Three stars. Charles Noreaster says check it out.